Times have changed along River Road since the first Acadian settlers arrived in St. James in the mid 1750s. A French Capuchin priest, Father Valentin, became the first resident pastor at St. Jacques de Cabahanoce, as it was referred to then. St. Jacques was the patron of Jacques Cantrelle, who donated the land for the first church and rectory. Cabahanoce is a Native-American term interpreted to mean “the roosting place of wild ducks”. The first baptism and first marriage were recorded in 1770. 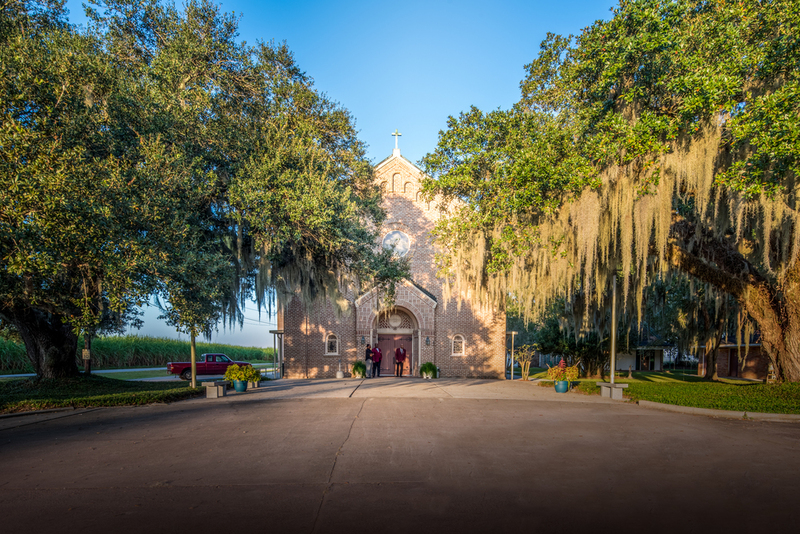 From a modest “shed church” to a magnificient Roman-esque three-steepled structure eventually claimed by en- croaching Mississippi River waters, to the present church built in the 1930s, the people of St. James have sustained their Catholic identity for these 250 years. While vast acreage of sugarcane is being replaced by tank farms, pipelines, infrastructure and industry, with a promise of even more to come, the church maintains a physical presence along River Road and a spiritual presence in the hearts of faithful members.